Today in Class 1 we had a lot of fun even though it was a half day. We could play together nicely with play food, blocks, and puzzles. 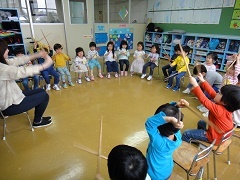 We had music time in Class 1 and practiced pretending to play “big” and “small” drums. The children did so well with rhythm sticks. We exercised with Classes 2 and 3 and then had phonics time. Today’s letter was “H” and the children could think of many “H” words and names. 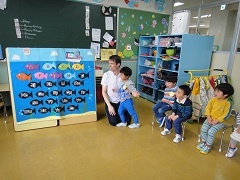 We helped our friend, ABC-kun get his “H” fish and found many “H” words for him. Good job, children! Tomorrow we have swimming and it will be so much fun.